My PhD focuses on the importance of inter-individual variation for the evolution of phenotypic plasticity. Currently, I am investigating how early-life experiences can change the inter-individual variability in the population. I work with an egg-laying lizard species and manipulate the temperature at which eggs develop in. Using empirical and molecular studies as well as, comparative approaches, I look at whether individuals' metabolic rate respond to temperature differently and how differences in metabolic rate can affect behaviour and life-history strategies such as how fast you grow, when you reproduce and how long you live for. My research interests are broad and include convergent evolution of complex traits, maintenance of variation in the population. I am a question-driven person, so I hope to work on a range of systems and subdisciplines in the future. I carried out my B.Sc at the University of Auckland (Double major in Biology and Statistics). After my B.Sc, I was an intern at Landcare Research in Auckland, NZ. I was working on a project that explored the effects of diet on survivorship in a phoretic flower mite with Dr Zhi-Qiang Zhang. I was also helping out on a project, which compared the infection rate of mites between male and female giraffe weevils with Dr Chrissie Painting. I completed my M.Res with A/Prof Martin Whiting and Dr Daniel Noble at Macquarie University. 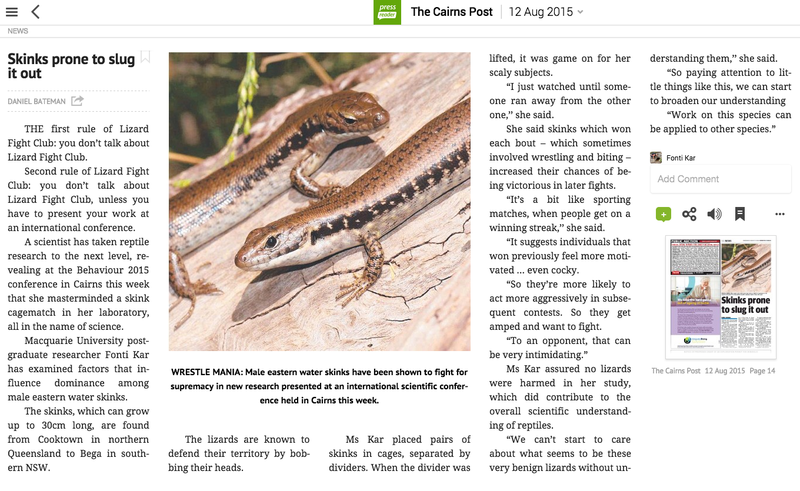 For my masters project, I was studying the contest behaviour of Eastern Water Skinks and the effects of dominance on social learning. Since graduating, I have been working as a research assistant / lab manager at the Lizard Lab. I have been analysing some cognition datasets, one of which looks at whether a family-living lizard is capable of learning from its conspecifics. Other than that, I have been helping Dan out with some behavioural and metabolic assays and overseeing the animal husbandry volunteers. I am an avid animal lover. When I am not working, I enjoy going to the beach but there are days where I just want to curl up in a blanket and binge watch TV shows. I like to go for hikes, or to the gym to unwind from work. I like taking dance classes and eating.